Just wanted to stop in and give you all an update on the ankle...Then I'm going to stop talking about it! LOL! I came home early from market as I was able to get a doctor's appointment today. On the way up to Dallas, it didn't stop me from going to the Bakery in West!Look at that happy face! Anything for bakery goods! It was so amazing to get the big heavy plaster splint off! I was a bit swollen but who cares! It was off! For a second anyway! Can you say pigs in a blanket! Oh back to the air-boot. This sucker has more Velcro on it than the Velcro kingdom in Velcroland! Ahhh, I have a thought,....I can upcycle the Velcro when I get this puppy off. I'll have enough Velcro to projects for YEARS! :) Once this humongous instrument of supposed self healing is applied, you can pump the blue thing up to add more pressure. Whatever! 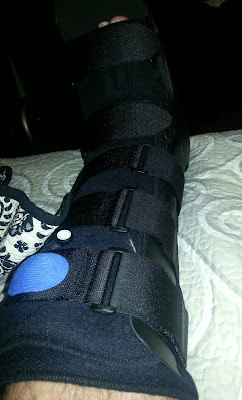 So, looks like six weeks in this contraption. 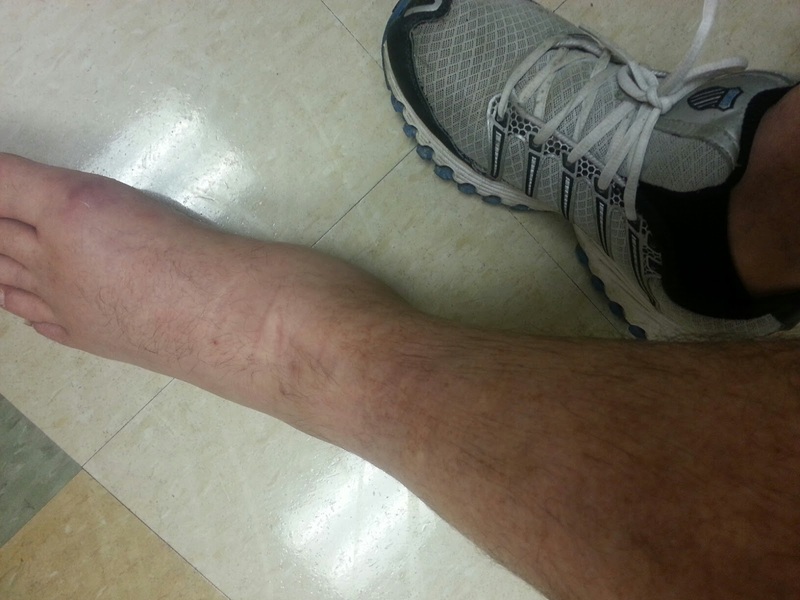 Doc says to put no weight on it yet, but that will surely come later. I'm really very happy that I have this boot. I would rather have this than a fiberglass cast in the 104 degree hot humid Texas Summertime! 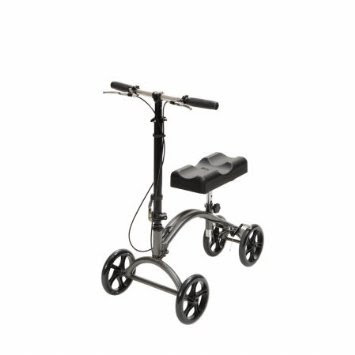 Now for the fun....For my mobility issues....THE KNEE WALKER! I LOVE THIS THING! It's like a scaled down 10 speed bike! I've been zipping through this house like a mad man! It even has brakes and a handy dandy little pouch to hold stuff on the go...Still trying to figure out how to put a cup holder on it for coffee...Then it will be perfecto! Honestly, think I need to go to Home Depot and rig that up somehow. I am so grateful to have this. I've really had a time with the crutches, walker and wheelchair...This seems to be the key along with the crutches and walker. You can even get this thing going fast enough you can take your right leg off the floor and cruise from the living room right into the bedroom! Too cool! LOL! Well, that's it from here. Doing just fine and feeling so much better than yesterday! My spirits have been lifted! Yay! You'd better tell Caesar to put all the breakables away. I can just see you flying through the house showing off your new skill. Wow, that looks like an awesome toy! Wish they had that when I had my knee done....lol Glad things are looking up. The knee walker thingy looks like fun. Don't want to break a foot to get one tho! Take care of that foot, need to see more crafty ideas out of your head. We have the same boot, we're twins!! I wanted to use the knee scooter but I have a bad knee too so didn't think that would be a good idea for me. Glad it's working for you. Hope you heal really fast! So glad that sense of humor is still intact!! 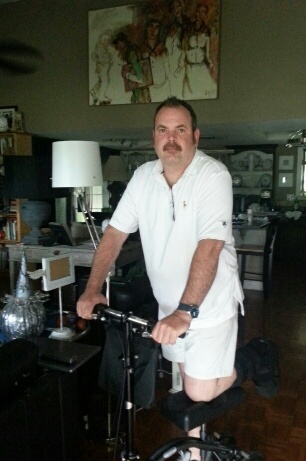 My Hubby used a knee walker when he had surgery for his achilles tendon. It was a lifesaver for us both! Keep rolling! Glad you don't need surgery! Love the knee walker - not seen those here in England, but it could be cos I've never broken an ankle... don't go so fast on it you crash and break the other ankle....! OMG you're too funny! I LOVE the way you write with such wit! BLAST, man, I miss ya! Ow how I love your story telling Jim! I must admit I am highly impressed with your Knee Walker! I've never heard of them, brilliant! Get better soon! I am s sorry you had this terrible accident, but there is a POSITIVE side to it. You can alter your splint then alter your walker so they will match. BAHHAHAHAHAH. No zipping around doing wheelies - we don't want any more nasty accidents LOL ! Good to hear you're feeling more positive and in a few 'short' weeks, all will be well. This is why I love you....so positive. You take a bad situation and turn it into an adventure. Hope you got a helmet to ride that thing! Be safe. Again, I forgot Tues was Tues. So missed ustream, if there was one?? Matter of fact just realized my son missed his shooting practice. Do I dare say this....glad when summer is over just so I know what day it is!! I'm glad your sense of humour is still intact. The knee walker looks like such a good idea - just be careful that you don't go breaking the other ankle to match! Have never seen one of those! But......See Jim. See Jim go. Go Jim. Go Go Go!!! I really liked the knee walker. Never saw one before. Pretty neat and better than crutches which kills my armpits whenever I have used them. Take care, hope the six weeks fly by! hugs! I promise I am NOT laughing at your misfortune, but I have laughed my head off reading this post. Trust you to be thinking of recycling all that Velcro! And I now have visions of you freewheeling through the house on your mini cycle thingy..... :) Seriously though, I'm so glad you're feeling more comfortable - and more mobile - with the boot. Hopefully, the next six weeks will fly by for you. O.K. Jim... let's not get crazy!! You remind me of my nearly-60 husband who likes to get the grocery cart roaring across the parking lot and then putting his feet up for a ride! If you fall off that thing and break an arm while your whooshing around... I'm just sayin'... BTW, I had to pay over $300 for one of those boot things at the orthopedist (recommended but not covered by insurance for my problem). Then my hubby found them on line for resale at a much lower price. Sell the doggone thing and you can buy LOTS of velcro!! Here's hoping for a continued speedy recovery! Oh Jim, I can so empathize with you. My DH fell/jumped off an 8ft. ladder trying to put a baby bird back into it's nest and ended up with a fractured ankle. They wanted to cast it, but he convinced them to put it into a boot. 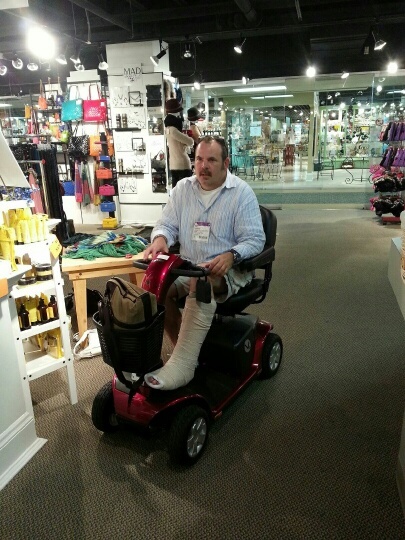 He almost ruined his back trying to deal with crutches, then finally rented a scooter before the VA was able to get him his own scooter. He had the soft cast first, then the boot for 6 weeks and the scooter, then just the boot (which he wore sporadically) and no scooter for the next 6 weeks. August 21 he goes in and returns the scooter and they will hopefully release him from the boot. Even now the exercises he's supposed to and does do them, do not seem to be helping him walk well. His ankle tires easily as well. So glad to read that you are doing better! I think that Knee Scooter looks pretty cool! Hmmm are you going decorate it up? I see Dyan's Bright colors and some of Tim's fasteners and such on it!!!! ;) Have a wonderful weekend!!! So glad you are doing better, love the scooter, haven't seen them here in Aussie, hope you get well Jim. have fun with thinking up ways to use the Velcro!!!! I think you should alter that scooter in your uber creative way!!! So glad to hear you're definitely on the mend and enjoying being "speed racer"! Take it easy though! Have great weekend!!! Yep, surgery is def an option with that kind of break. My partner in crafting crime had surgery and the nifty air boot - she decorated her's with tons of Prima, so I'm looking forward to seeing how you alter yours. As for getting around with a cuppa and all the other goodies - I could give you loads of "how to" with a wheelchair, but the knee scooter looks like a lot more fun! Glad to hear no surgery and that you seem to be zipping around easily on the new contraption - but good god, don't get too daring on that thing and pull an Arte Johnson tricycle stunt...LOL! The 6 weeks will be over before you know it! I found that following medical advice on the "do not" made recovery faster and physical therapy is a blast and really helps. Friends who know everything, went to gym, walked( the I'm not using that thing) spent longer incapacitated. Thanks to pain killers then Tylenonal recovery is weeks not months. oh Jim - keep that velcro boot! I've busted up my ankle 3 times with the doctor telling me I had a "weakened" ankle from the first fracture! Keep that velcro boot - they are pricey! I'm glad you are on the mend - you'll be back to your old self before you can find those scissors in the middle of the night! Creative people take creative falls! I can say this because I am the proud owner and wearer of a cast boot on my foot as a result of a sandal and some loose carpeting that happened about a week before your creative fall. I know the pain but you have the greatest attitude so it will be all good! Just don't overdue it (you definitely are an overachiever) and let it heal as it needs. I enjoy your videos so much as they have taught me things no one else does - you have inspired me to learn more and go beyond just making cards! Thanks for all you do! Sending good thoughts and prayers for quick healing! Hey Jim,, really sorry about you broken ankle!!! Take care of yourself and heal quickly!!! Been following you and what you do for a while and I love all the things you design and the boxes you make. I have learned a lot. For that I am thankful. Just a quick question about something you mentioned in your above post, what is the "market" that you spoke about? Just curious, for no other reason than, "jus wonderin'"
My goodness! Who even know a knee scooter existed? I'm so glad someone invented it, and that it is helping you. Poor guy, I really feel for you!! Lots of good news. I never ever heard of a knee scooter til now...but what a great idea. 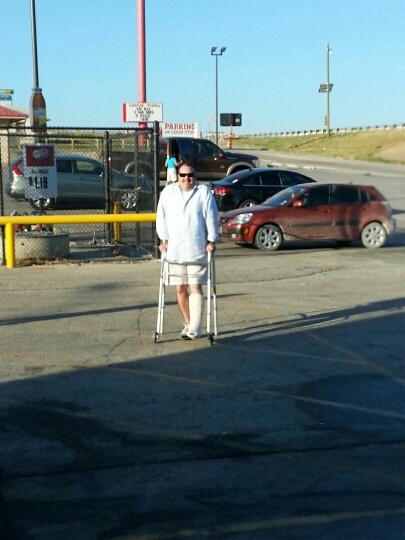 Glad you are off the crutches and out of the heavy plaster cast. That has to be a relief. Hang in there...time will pass quickly!